Taarkashi (taar meaning wire), is the technique of inlaying fine flattened wire of brass copper or silver in wood . The patterns inlayed are usually intricate geometric forms or florals from Mughal arts. Metal inlay is a painstaking and highly skilled process. Tarkashi work is seen in the old palaces and mahals of Rajasthan. These palaces have beautifully inlaid doors with ivory and intricate floral or geometric patterns. The same skilled craftsmanship is found in the inlay work in thrones, howdahs and horse or camel saddles. Tarkashi work is done on hardwood. In this process,dark coloured and seasoned sheesham wood is used. The high oil content of this wood allows the inlaid metal to be held securely. 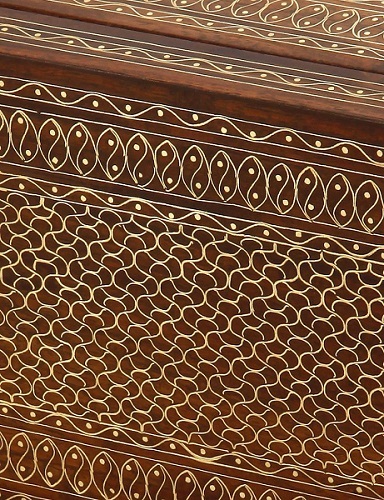 The patterns, usually geometric forms or florals of Mughal inspiration, are drawn on the wood and then engraved with a half round chisel and hammer to a depth of 1 mm. Thin strips are cut from sheet metal, heated over a flame, cooled to remove the temper in the strip and straightened. The resultant metal strip is beaten into the previously created grooves with a hammer. Small coiled dot-like forms called bhiriyan, an element unique to tarkashi, are beaten directly into wood. After the surface is evened with a sander, or silli, fine sheesham sawdust mixed with diluted adhesive is applied over the entire surface until all the gaps are filled. The object is then planed, sanded with a water based emery paper and machine buffed to give it a smooth polish. The art of inlay was highly developed in the Safavid era, during which artists created precious works including doors, windows, mirror frames, Quran boxes, inlaid boxes, pens and penholders, lanterns and inlaid ornamented shrines. The artisans from Jaipur are said to be the descendants of the skilled workers of Manipuri in Uttar Pradesh. They migrated here during the reign of Maharaja Jai Singh II. 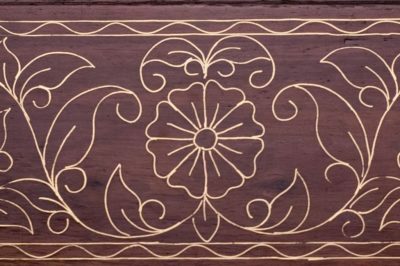 In each cubic centimeter of inlaid work, up to 250 pieces of metal and wood are laid side by side. This craft continues to enjoy a pride of place in the modern world. 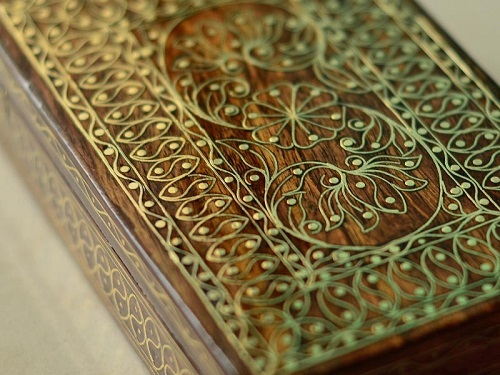 Traditionally the work was seen on ornamental boxes and tables. Now the designs can be seen on other utility items like trays, plates, spice boxes, etc.